Free shipping to any location in the United States on fitnessfinders.net website orders of $100 or more. For orders of $30 or less, add $8 for shipping. $30.01 to $60, add $10 for shipping. $60.01 to $100, add $11 for shipping. We offer Free Shipping on all online orders over $100. For all orders over $100 that are faxed or emailed to us, shipping costs will be applied. Shipping Calculator: To estimate your shipping costs, simply go to your completed shopping cart and at the bottom of the page select the method of shipping in the shipping calculator, or call us with your subtotal at (800)789-9255. Lost or Damaged Shipment: Fitness Finders, Inc. is not responsible for shipping costs and they are non-refundable. In the case that your shipment is lost or damaged in transit, you are responsible to file the claim with the shipping company. Fitness Finders, Inc. is not responsible for lost packages during transit or shipments sent to a forwarding address. Fitness Finders, Inc. is also not responsible for weather-related damage or delays. Once a package leaves our facility, it is completely out of our control. 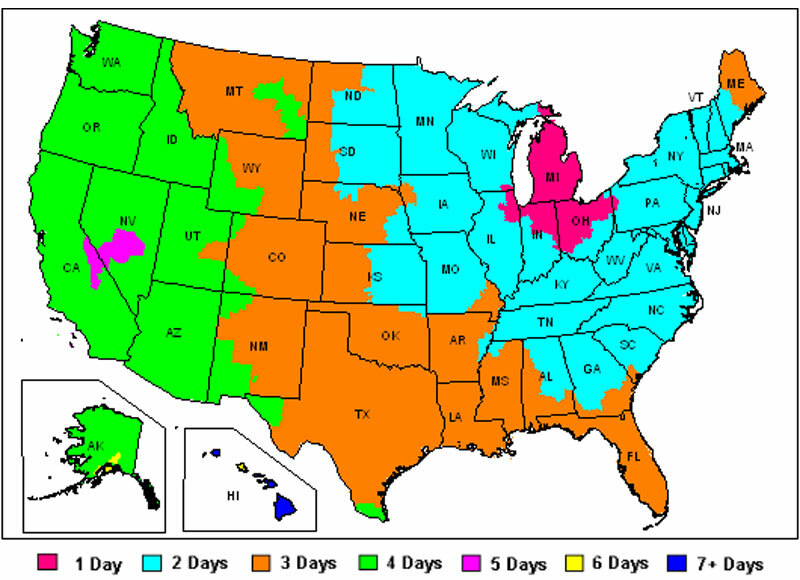 The following chart gives approximate shipping time frames from our Michigan location if you select our standard shipping option.